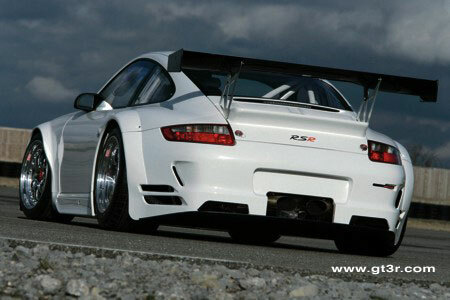 basis: Porsche 911 GT3 RS (997; street legal version), homologated from January 2007 onwards. Monocoque body (basis 997 GT3 RS) of hot-galvanised steel (add-on parts made from carbon/kevlar fiber). aerodynamically optimised front end with front spoiler. bucket-type racing seat (driver side only) with flame-resistant seat cover. 90 litre FT3 safety fuel tank with quick refuelling system. Sachs four-way gas pressure dampers. double coil springs (main and ancillary spring). front axle arms adjustable for camber. adjustable sword-type anti-roll bar on both sides. power steering Multi-arm axle with rigidly mounted axle sub-frame. double coil springs (main and auxiliary spring). rear axle tie-bar reinforced and infinitely adjustable. without ABS, dual master cylinders, brake force balance adjustable by bias bar system. weight-optimized internally vented brake discs; 380 mm diameter. weight-optimized internally vented brake discs; 355 mm diameter. Bosch MS 4.0 engine management Motec display with integrated data recording. battery: 12 volt, 50 Ah. The Porsche 911 GT3 RSR (Type 997) is in compliance with the current Le Mans GT2 regulations of the Automobile Club de l’Ouest (A. C. O.) as well as the regulations of the international automobile assembly FIA for Series Grand Touring Cars, thus enabling the participation in various racing series. 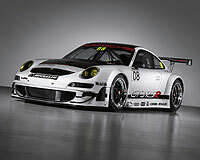 The Porsche GT3 RSR launches into the new model year with extensive modifications. 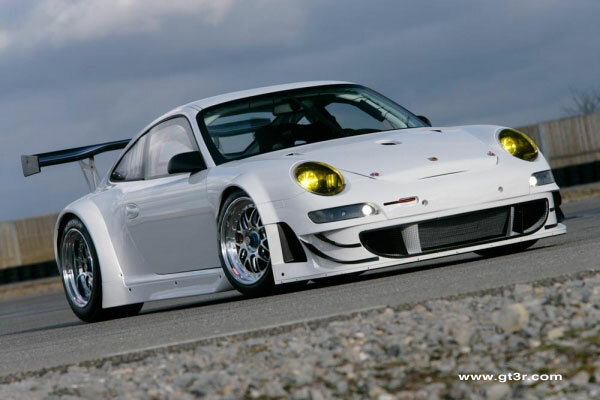 The most powerful race car based on the Porsche 911, which last year scored wins at the 24 hour races of Le Mans and Spa as well as overall victory at the Nuerburgring 24 hours, competes in the GT2 class at international long distance races. The most distinguishing feature of the new GT3 RSR is the front end which received major improvements to the aerodynamics. The majority of innovations however are hidden under the weight-optimised body. 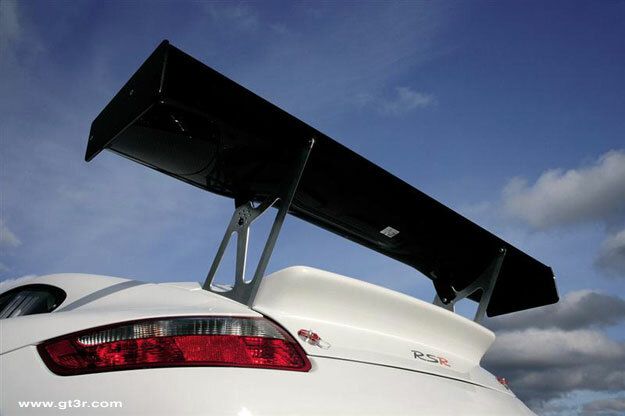 Aside from the easily recognisable additional spoilers on the front apron, so-called flicks, an optimised air ducting with newly-designed side air outlets generates more downforce and reduces drag. The rear end including the rear wing was taken over from the predecessor. Extensive changes to the suspension cinematics increase mechanical grip considerably. The range of possible suspension set-ups was broadened. The 3.8-litre boxer engine of the GT3 RSR remains unchanged apart from slight improvements to details. It delivers 465 hp (342 kW) at 8,000 revs per minute and delivers a maximum torque of 430 Nm at 7,250 revs. The rev limiter of the efficient six-cylinder kicks in at 9,400 rpm. Much of the know-how in the GT3 RSR’s totally new gearbox has come from the RS Spyder sports prototype. The sequential six-speed unit, developed by Porsche engineers, is considerably lighter than its predecessor. Internal friction was substantially reduced. The flat angle of the drive shafts allows teams a wider range of suspension set-ups. 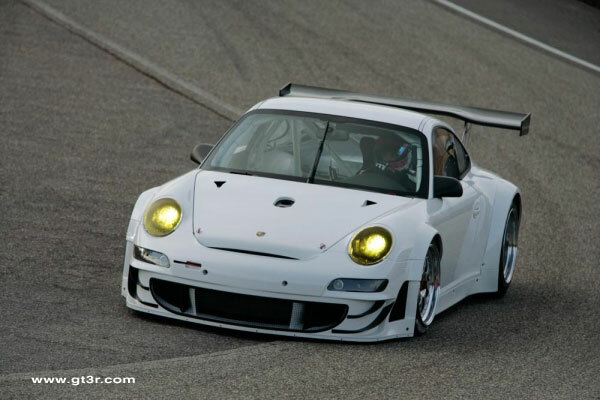 Additionally, the RSR convinces through re-designed, service- and driver-friendly electronics. 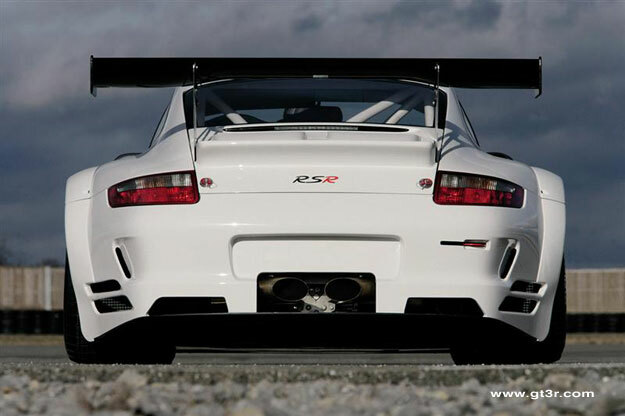 Performance and reliability remain the outstanding characteristics of the 911 GT3 RSR. 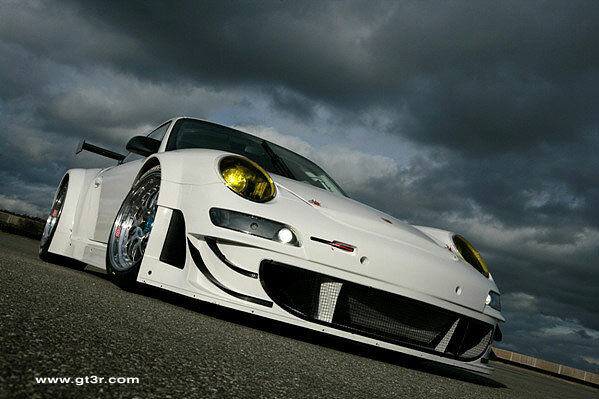 The most distinguishing feature of the GT3 RSR (MY 2008) is the front end which received major improvements to the aerodynamics.